We have just finished the last transnational meeting of partners which was held in Poland, Lodz. Since our work in the project is coming to an end, we discussed the achievements and results of our 2-year long cooperation, as well as ideas for the future. 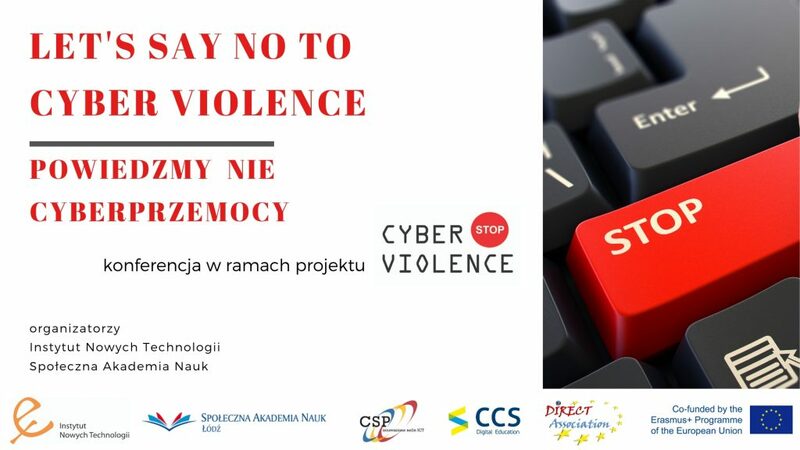 The meeting was connected with a conference „Let’s Say No To Cyber Violence”, held on the 7th of February 2019 and organized in cooperation between Instytut Nowych Technologii and the University of Social Science in Lodz. We presented results from the „Cyber Violence” project – published materials for teachers, educators parents and youth, which are available on our website, in the section OUTPUTS. During the conference experts shared their knowledge, experience and suggestions how to stay safe from cyberviolence. We could listen to presentations from: Michał Brykowski from the Lodz Provincial Police Station, Jakub Kotarski from an ICT company backup.pl, Magdalena Celeban from the foundation Niech Się Dzieje, and Barbara Michalska from Fundacja Kreatywnych Rozwiązań Edukabe. We are grateful to Phd. Andrzej Marjański and Phd. Anna Staszewska for cooperation and hosting us at their university. We are also grateful to our international partners and all the audience for joining the conference!